Vaishnava Seva Prabhu’s father, Shriman C K Shah, left his body on 17-7-17 at 11.03 pm. The day coincided with the disappearance day of Srila Loknatha Dasa Goswami and the Brahmotsava of Sri Sri Radha Gopinath. Three years ago, he had started developing dementia. And four months ago, his left side had been paralyzed, which had left him mostly bed-ridden and semi-conscious. He had been on the border of life and death, with no hope of recovery and with the possibility of passing over at any moment. Thankfully, when that moment came, his family was around him. 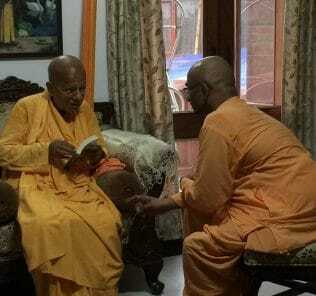 Vaishnava Seva Prabhu had very much wanted to be by his father’s side during his last moments. He had been concerned that if that time came during the day when he was in surgery, he wouldn’t be able to leave the operation theater with the surgery half-done. And if that moment came at night when he and his wife, Kalindi Mataji, were asleep, then too his father would depart alone. Wanting to prevent that eventuality, he would wake up several times each night just to check his father’s condition. Fortunately, that moment came when both he and Kalindi Mataji were at home. On the night of 17th July, after Vaishnava Seva Prabhu finished his dinner prasad at around 10.45 pm, he got an intuition that something was wrong. He noticed that his father’s breathing had become slower and more strained than usual. He immediately called Kalindi Mataji and she found that his pulse had gone down to an all-time low. Sensing that the end was near, they both started chanting intensely. 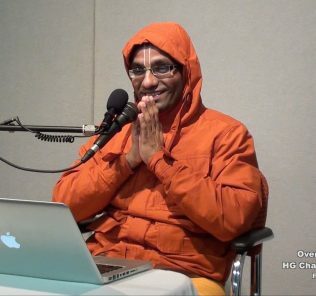 Despite being paralyzed, his father, on hearing the kirtan, started moving his leg gently in response to the singing – he had a habit of doing that while hearing kirtans. Slowly, the movement of the leg decreased. And within the next seven minutes, he breathed his last, with the sound of the holy names in his ears. In addition to the time of departure, even the day of departure had worked out wonderfully. For several months, Kalindi Mataji had been reading scripture to him every night. She had completed reading the full Bhagavad-gita a few days ago and had thereafter started reading the Bhagavatam. Just that very night, she had read the Bhagavatam chapter about Kunti’s prayers, repeating the celebrated namo pankaj nabhaya … (1.8.22) verse thrice in his ears. After completing that chapter, she had started reading the next chapter about Bhishma’s departure. As this chapter describes the ideal way to depart, Shri Shah’s hearing that chapter on his last night was a special blessing. Not only was the moment of departure divinely orchestrated, so were the preceding events that laid the setting for this moment. 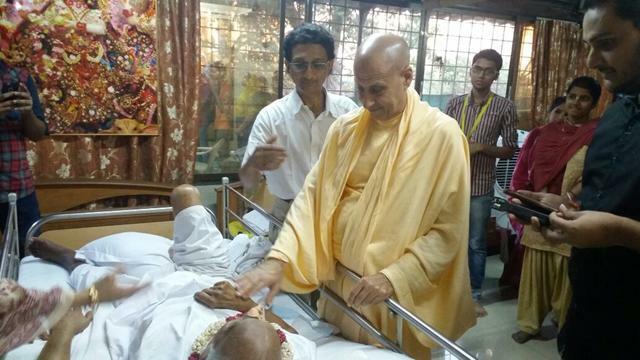 For many years, Shri Shah had been averse to even visit Vaishnava Seva P’s house, leave alone stay there. Like most fathers, he had had great dreams for his son. When Vaishnava Seva Prabhu had started practicing bhakti, his father had become upset. His anger was not because they were from a Jain background, but because he feared that his son would neglect his career. In his disappointment, he had spoken heated words to, Vaishnava Seva Prabhu’s spiritual master, HH Radhanatha Maharaj. He had even threatened to not attend Vaishnava Seva Prabhu’s marriage. Over the years, his heart softened when devotees helped him during his times of need. When he underwent his first cardiac bypass surgery in 1996, several devotees donated blood, and senior devotees such as HH Bhakti Rasamrita Maharaja and Krishna Chandra Prabhu came to see him in the hospital. This touched him deeply and accelerated the transformation of his heart. Significantly, the seed of that transformation had been sown more than two decades earlier. In the early 70s, he had seen Prabhupada walking on the Juhu beach and had attended three days of Prabhupada’s Cross Maidan program. He had been especially impressed by seeing foreigners practicing bhakti enthusiastically. After recovering from the bypass surgery, his appreciation for devotees increased, and he started using his influence to assist them. During the early days of Bhaktivedanta Hospital, he asked his friend Mr Damji Anchorwala to sponsor the entire ICU. Additionally, he used his experience in pharmacy to help systematize the hospital’s pharmacy shop. Still, he remained reluctant to visit his son’s house in Mira Road. But in 2014, while he was staying at his residence in Andheri, he started showing signs of dementia. Under the influence of that distressingly degenerative disease, he would sometimes become aggressive. When his family members there found it difficult to calm him during those times, Vaishnava Seva Prabhu offered to take care of him. Dementia had blurred much of Shri Shah’s memory, and along with it had been blurred his unwillingness to live with his son. 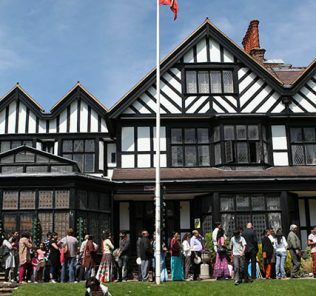 At Vaishnava Seva Prabhu’s residence, which is also the office of ISKCON Desire Tree, the overall devotional atmosphere, as well as the association of the devotees working there, had a soothing effect on him. His aggressiveness subsided, and he grew fond of devotees. 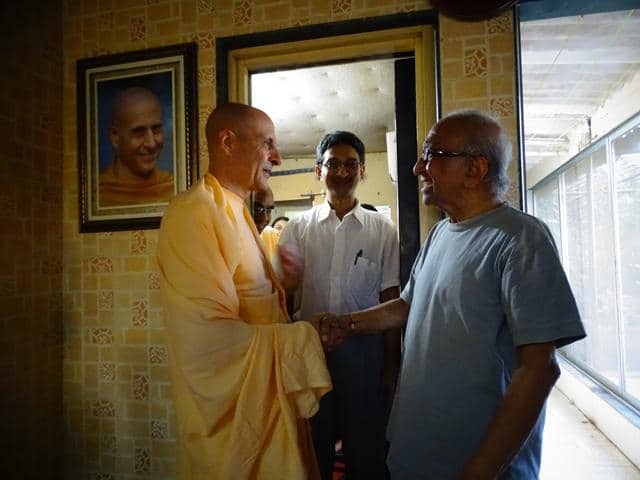 When Radhanatha Maharaj visited the ISKCON Desire Tree office, he had sweet, memorable interactions with Maharaj. 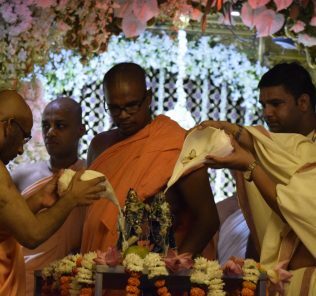 I had the fortune to be present at that time and I had written about it here: A giant desire tree blesses ISKCON desire tree. During the months when he was paralyzed, devotees would almost daily bring charnamrita for him. Radhanatha Maharaj visited him once more. He had been taking prasad for over two years and now he was given prasad through a stomach feeding tube. Prabhupada’s Hare Krishna dhun and other devotional kirtans would go on twenty-four hours near him for the last several months of his life, till his last moment. On the morning after his father’s departure, Vaishnava Seva Prabhu, with his characteristic humility, told me that because of his immaturity in the early days of bhakti, he had alienated his father. He had been hoping to get an opportunity to make amends. His father’s dementia, though it had been difficult for all his family members, had become the means for him to make amends. It that enabled him to serve his father both materially and spiritually: materially by providing the required bodily and medical care, and spiritually by providing a devotional atmosphere. Vaishnava Seva Prabhu appreciated his wife Kalindi Mataji for extending herself to take care of his father, treating him as if he were her own father. Shri Shah had initially not approved of their marriage and showed no affection to his daughter-in-law till the time of his first cardiac bypass surgery. When she served him attentively during his hospital stay and recovery, his heart started softening. He became more appreciative over the years when she consistently took care of him whenever he was sick and was hospitalized. In April 2015, when he came to stay with them, they bonded nicely. When he heard her doing kirtan with harmonium, he liked her sweet singing and encouraged her to practice and develop her singing ability. 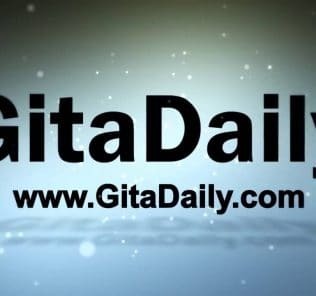 Kalindi Mataji felt grateful that during his last days she could do her duty to him properly by reading the whole Gita to him and by singing for him daily after he became bedridden. Vaishnava Seva Prabhu appreciated his father for having infused within him the drive to achieve. During his school days, he had been apathetic about his studies. But his father had pushed him to study seriously and to pursue a medical career; whatever he had achieved materially, it was primarily due to his father’s motivation. His father had imparted within him the zeal to take initiative, learn new skills and branch out into diverse areas. 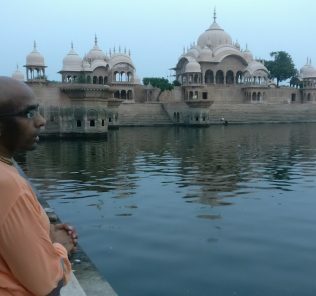 He had been able to use all these in Krishna’s service through ISKCON desire tree which had started as an audio resource but has now become a multimedia online outreach platform with its flagship Hare Krsna TV reaching over five million viewers. Seeing the departure of anyone in any situation is sobering, but seeing someone’s departure in a devotional setting is also uplifting. Contemplating how devotees strive to arrange for such a setting for their loved ones deepens our appreciation for devotees. And contemplating how Krishna orchestrates events to arrange such a setting for a soul, even a soul not directly practicing bhakti, boosts our faith in his expert benevolence. Even if things seem to be going wrong, Krishna can inconceivably bring good out of the bad. After all, who could have conceived that dementia might become a blessing that removes one’s blocks to receiving Krishna’s mercy? Through life and through death, Krishna is present in our hearts, guiding our wanderings. How he orchestrates circumstances to thrust mercy is demonstrated poignantly through the departure of Shriman C K Shah. May the Lord that guides all souls take the departed soul to spiritual serenity. May that Lord guide us all through our life-journey in preparation for our final moment. May our Lord give us the faith to cooperate with his inscrutable ways and to always live in the light of his guidance. Hare Krishna.. thank you sharing, it strengthens out faith..